Who would you be in an alternate universe? Would you be a superhero? A pop-star? An animal? What would you look like? What personality traits and features would you possess? These and many more questions served as inquiry in our unit taught in Tom Noel’s 4th and 5th grade class at the Lab School–Exploring the Alter Ego. Students began by looking at examples of famous alter egos from pop culture such as Superman and Clark Kent, Hannah Montana and Miley Cyrus, and even Mrs. Doubtfire. They were even visited by Eileen’s alter ego, a pop star named Marley Mae Mepson (a character played by Hilary). And later on, Hilary’s alter ego, an Irish Stepdancing leprechaun (played by Eileen) visited the class. With each of these examples, we looked how the personalities of the real person compared to the alter ego. What the students discovered was that the personalities and interests of the alter ego tended to be the opposite of the real person. For example, if a person were shy in real life, their alter ego may be a pop star, who had no fears in front of an audience. With this, the students began to consider their own alter egos. 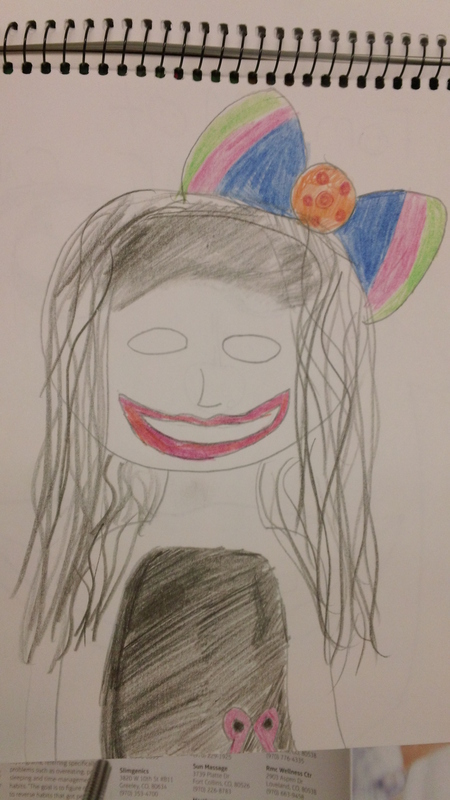 In the first lesson, Alter Ego Portrait, the students were asked to create a two-dimensional visual representation of their alter ego. 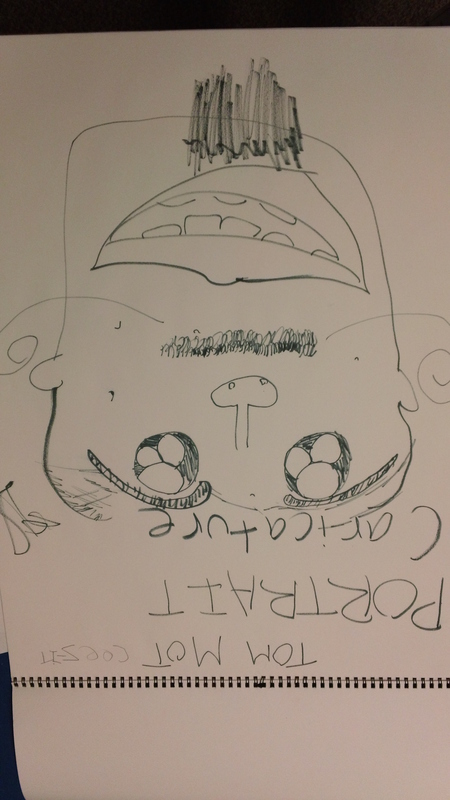 We explored this through the use of caricature in drawing. 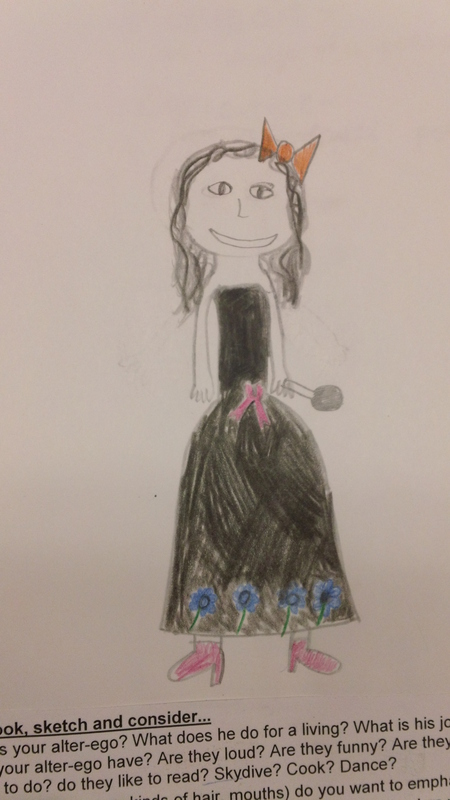 In looking at celebrity caricatures we discussed how certain exaggerated features emphasized personality traits. For example, Justin Bieber’s lips were exaggerated to show his passion for singing, and Michael Phelps was shown with a mermaid tail to emphasize his swimming ability. Students were asked to consider their own personalities and find the opposite in their alter ego. They explored how certain exaggerated features such as large eyes or a small nose could emphasize certain characteristics in their caricature style acrylic paintings. Students began by developing sketches, then created 18×24” painted caricatures of their alter ego. In the second lesson, Unmasking the Alter Ego, the students transformed their caricatures into three-dimensional forms. 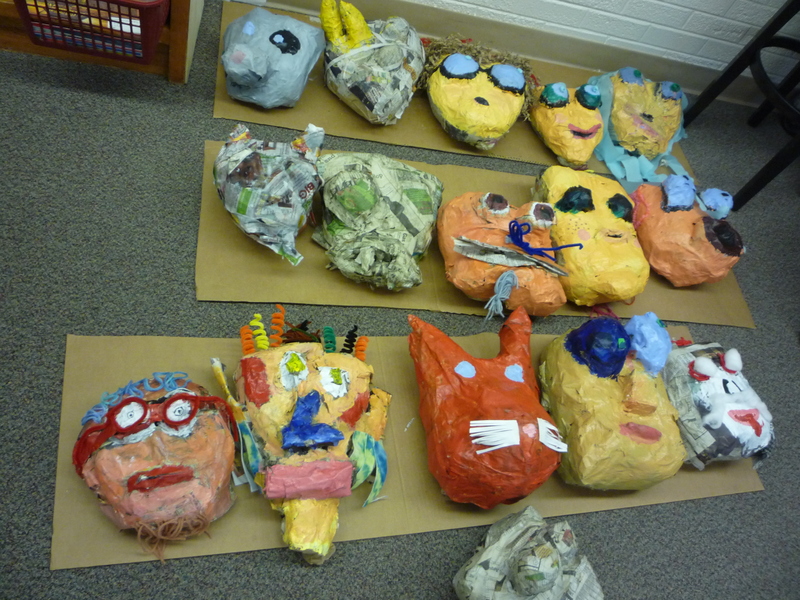 Still considering exaggeration in their work, students created masks of their alter ego. We discussed the transformational power of masks, and how they have been used throughout art history as well as today. 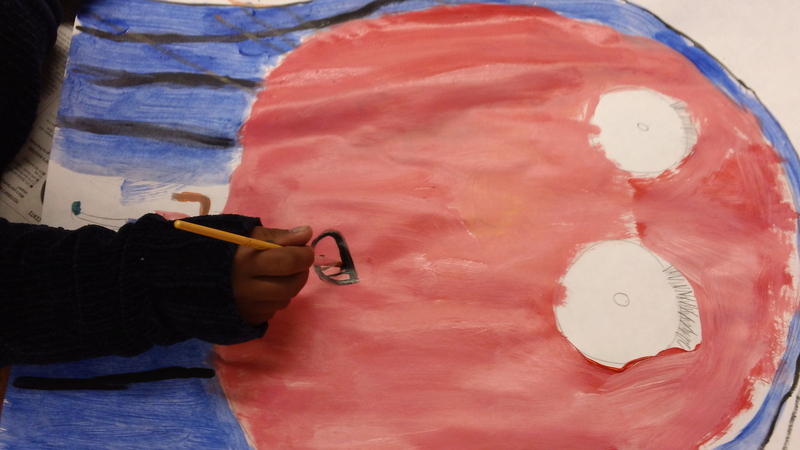 Students were also asked to consider the impact of color on a piece, and how certain colors convey particular emotions. 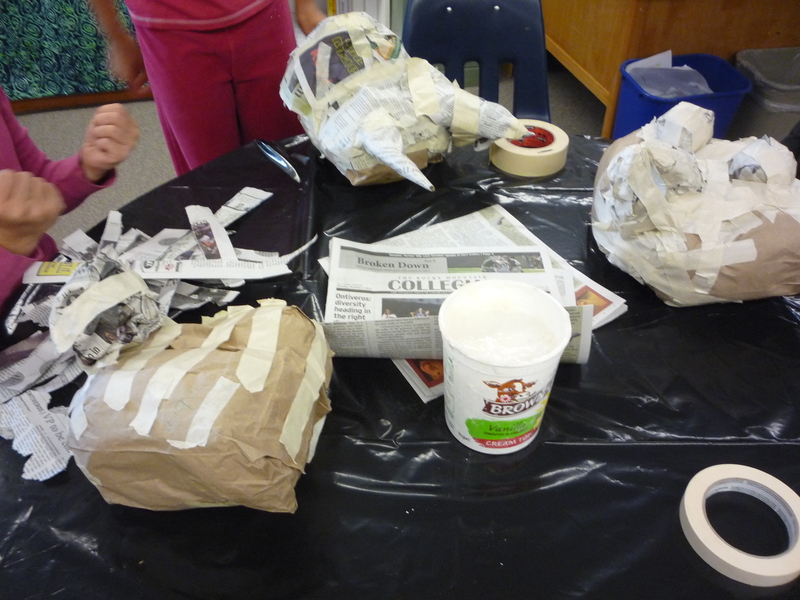 The students created armatures using stuffed paper bags and newspaper, then used papier-mâché with wheat paste to cover the surface. 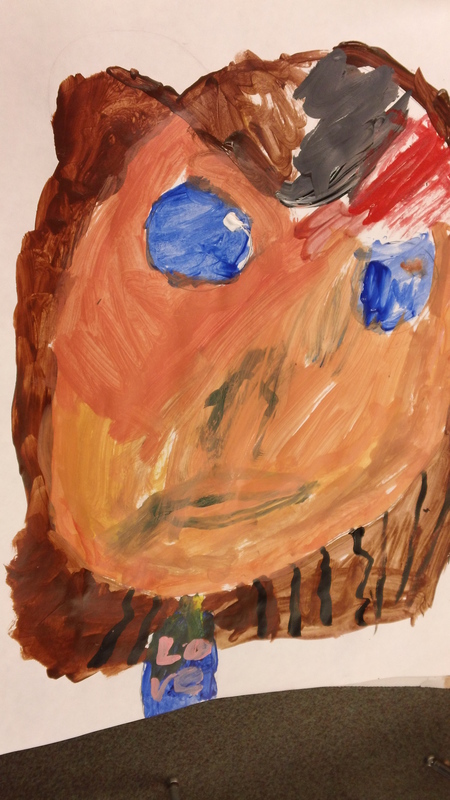 They painted the surfaces using expressive colors, and were also given an array of other media and collage materials such as yarn, pipe cleaners, felt, cotton balls, and paper to add to their piece for hair and accessories. In the third lesson, Becoming the Alter Ego, the students made their alter egos come to life. Working collaboratively in small groups, they created a scene in which their alter egos interacted with one another. The students were asked to write a script that encompassed the personalities of their alter egos as described by their caricatures, and act out the scene using their masks. We also discussed storytelling through visual language. The groups were asked create a backdrop for their scene that explained the setting through visuals. The backdrops were created on large butcher paper using acrylic paint and collage. Students took turns recording each other’s scene in a video to be shared at the art show. Through this they also learned the importance of digital recording in 21st century art making. Visual Arts communicate the human experience through different points of view. 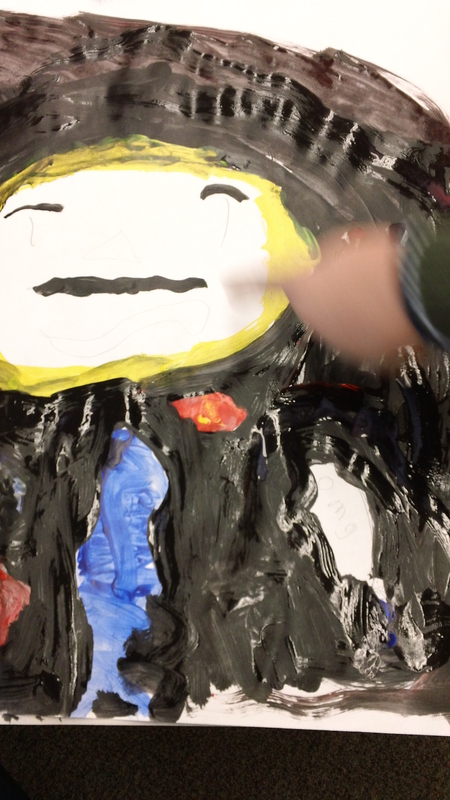 Visual Arts connect multiple characteristics of art and allow viewers to respond. Artists and viewers determine intent through expressive features. Analyzing the formal and sensory qualities gives the ability to make inferences and feel empathy toward the work. Evaluating and Critiquing allows one to respond through making judgments about the artistic and aesthetic elements. Planning methods, processes, & philosophies of art & design contribute to the intended meaning of the work. Use artistic methods to express and communicate personal interests and objective points of view. Create art using technological media. Materials and Process can be applied in traditional, unique, and inventive ways. Artists, viewers, and patrons make personal meaning and can infer the artist’s intent. Historical time periods and both familiar and unfamiliar cultural settings are interpreted in works of art by artist’s, viewer’s, and patron’s. Students used critical thinking and reasoning in the invention of their alter egos. 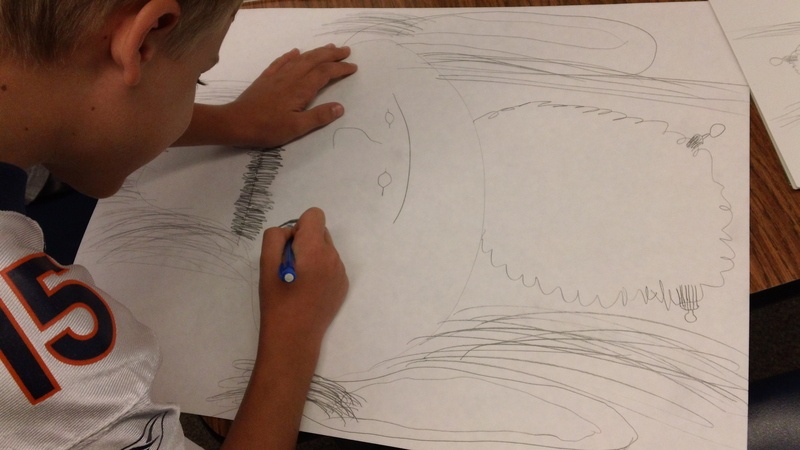 Using their sketchbook as a planning tool, students explored possibilities for their caricatures. With each sketch they reflected on their work and created new drafts they discovered the best way to communicate their ideas visually. Students had to think critically in order to discover the personalities of their alter egos. Each student had to think about their own personalities—the characteristics and traits they possessed—then transform these ideas into a character that is opposite. Collaboration was used in the third lesson, in which students worked in groups on a presentation and art piece. As a group, the students worked together to plan and paint a backdrop. In addition, they collaborated in writing a script to present their work to the rest of the class. 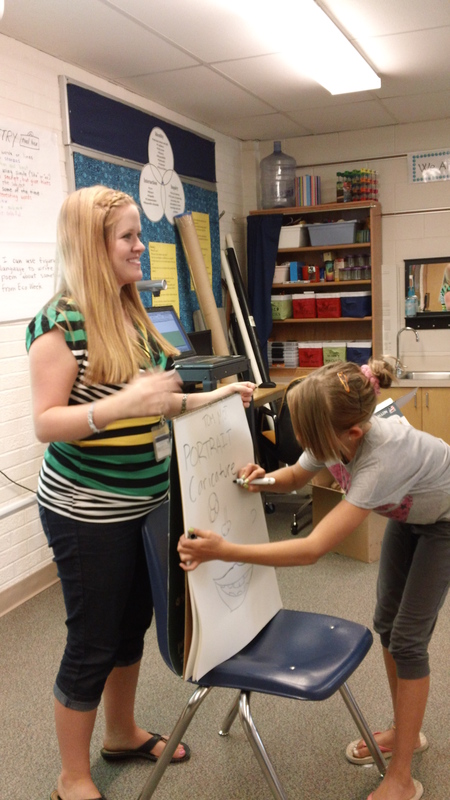 Students practiced invention through the critical lens of change and transformation. 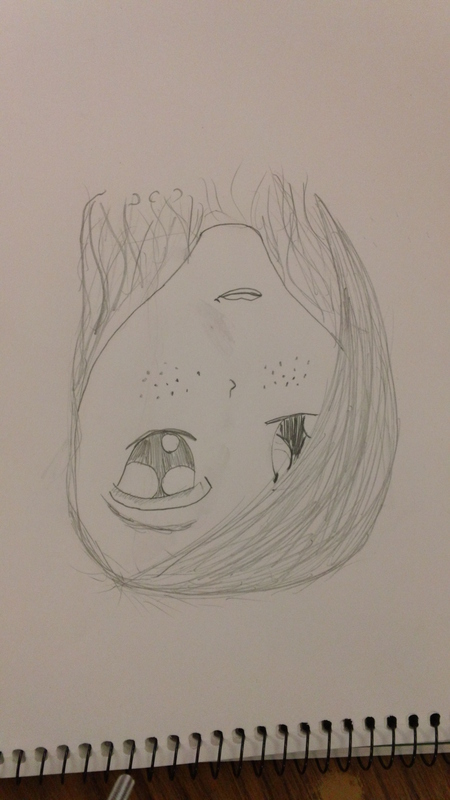 With this overarching concept, the students invented their alter ego through transformation of the self. In the third lesson, they transformed into their alter egos, and invented collaborative stories to express the ideas behind their masks. The artwork produced showed great innovation and students stretched and explored the materials, making discoveries along the way that they used in the execution of the piece. It was great to bring all the work from the semester together at the art show! Students were able to see the art pieces presented in a gallery manner, giving pride to their work and effort. The students in this class are truly talented individuals, and continue to surprise us with their ideas and innovation. Thank you for this opportunity to work with the Lab School! This week almost all of the students were finished with the papier-mâché process, and it was time to work on embellishing the alter ego masks. 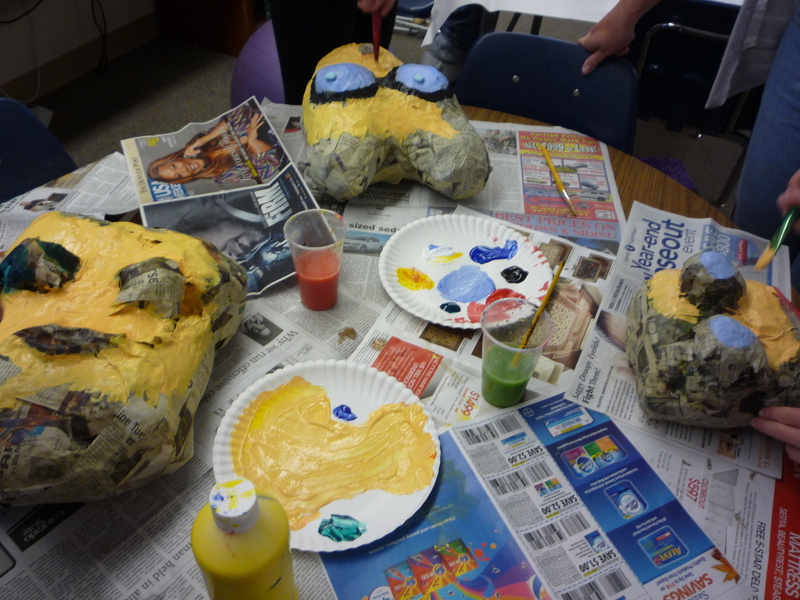 Students were given acrylic paint and encouraged to cover the front and sides of the mask. Painting the backside was optional because the mask is a relief. 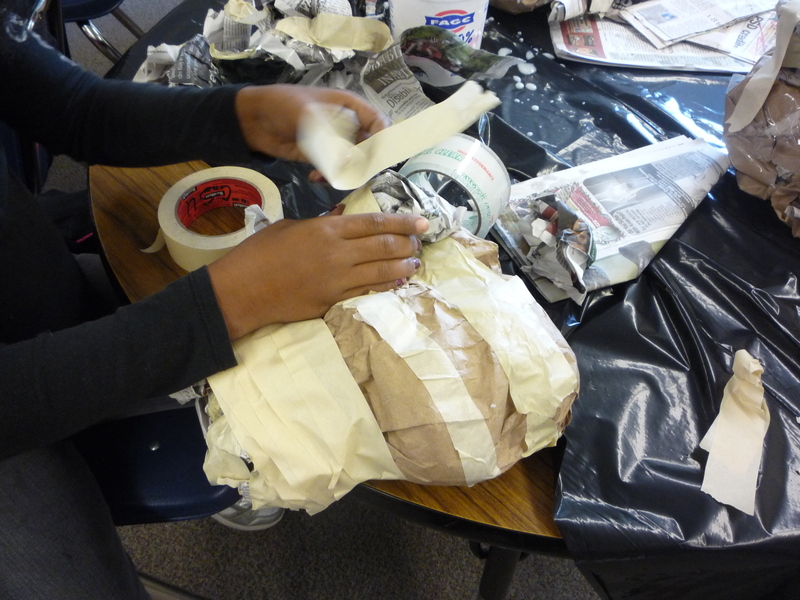 However, students were not limited to paint in terms of materials. In order to create hair, beards, mustaches, and many other finishing touches, students were given an array of materials to use. Yarn, feathers, crepe paper, pipe cleaners, and construction paper were a few of the options to work with. Nevertheless, the main goal this week was to finish painting the masks. At the beginning of the lesson, we discussed the use of color and how it relates to feelings or emotion. Students thought about the colors they were using in regard to how it conveyed the personality and feelings of their alter egos. 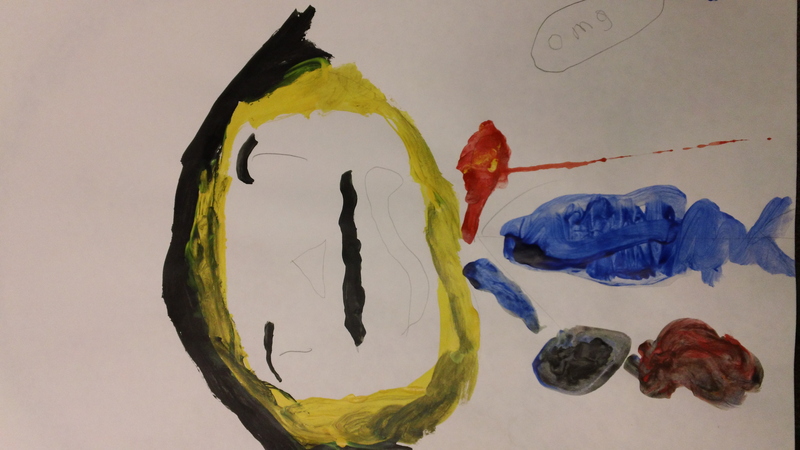 Student 1 decided to paint the eyes of his alter ego two different colors. He explained that the darker blue on the right eye showed his alter ego’s connection with the real world, and the way he constantly observes what is going on around him. The “sky blue” color, as he called this shade, is his alter ego’s dreamy eye, because he is often unconnected with reality, and dreaming of fantastical things. Student 2 works very quickly—probably the quickest of his classmates. However, he is not rushing. He uses this to his advantage to continuously reevaluate what he has done, and is always willing to make changes to improve his piece. 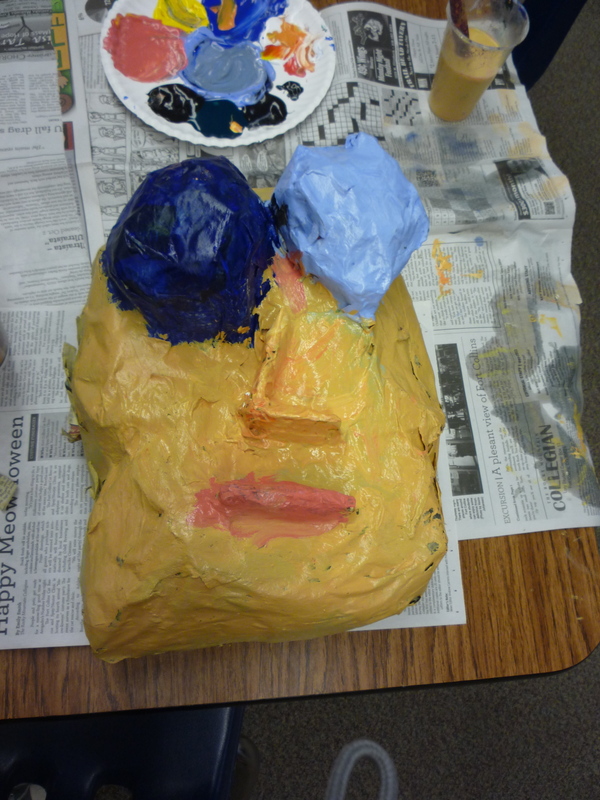 Last week, he was the only student to paint his alter ego mask, and appeared to be done at the end of class. Yet, this week he added another coat of paint and continued to add to and make changes to his piece. Although he painted the glasses right on the mask last week, this week he decided to create them out of pipe cleaners in order to emphasize their presence on the face. He also covered up the painted beard he had on his mask and began making it out of yarn instead. Many students decided to make significant changes of the appearance of their alter ego from the painted portrait to the relief mask. 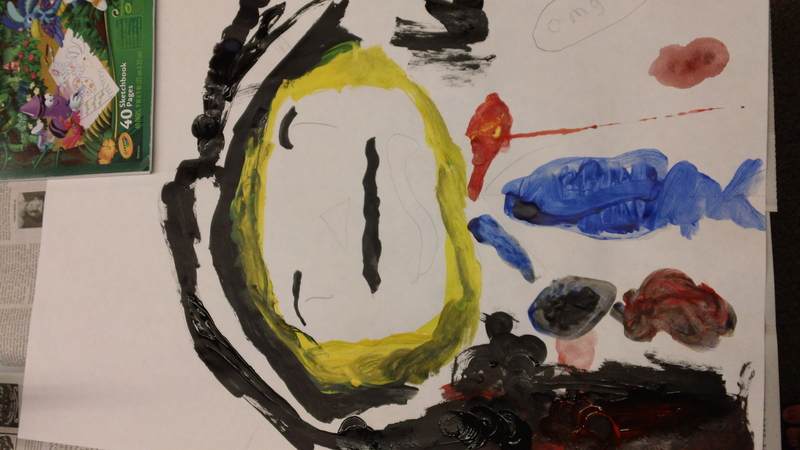 Student 3, on the contrary, wanted to make her mask as similar to the painting as possible. On her alter ego mask, she created the same skin tone as her caricature, explaining that it is the opposite of her own dark skin. She also chose to make the hair blue once more, because it is her alter ego’s favorite color and emphasizes the color of the eyes. She chose to use crepe paper for the hair because it is light, long, and flowy—another opposite from her own short hair. Students worked very collaboratively during this class period, sharing thoughts, ideas, and critique, as well as insight into mixing specific colors. They found that working in groups was time efficient (since this was the only day to paint) as well as a more economical use of paint (paint often goes to waste when only one student is using a specific palette). This collaboration will hopefully continue to build in a positive manner, and allow for effective group work in the final lesson. 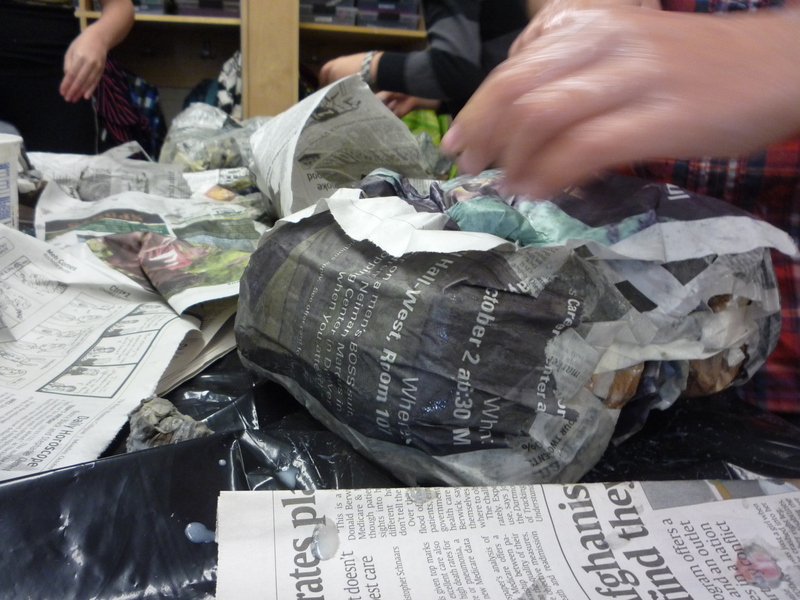 This week the class was introduced to a new technique: papier-mâché. 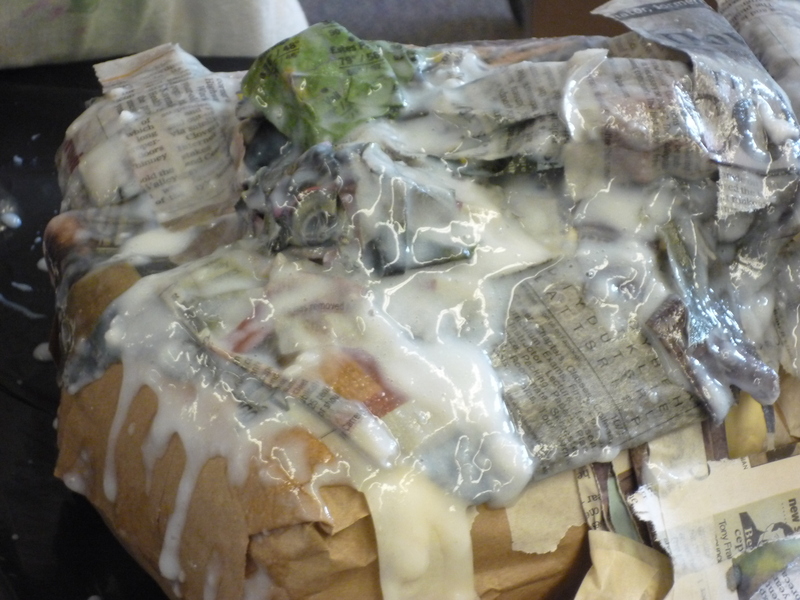 The materials involved with papier-mâché can get pretty messy, so the students sat at large tables covered in plastic. Art class is a time when it is okay to get a little messy—it’s expected! So the students dove right into the work. 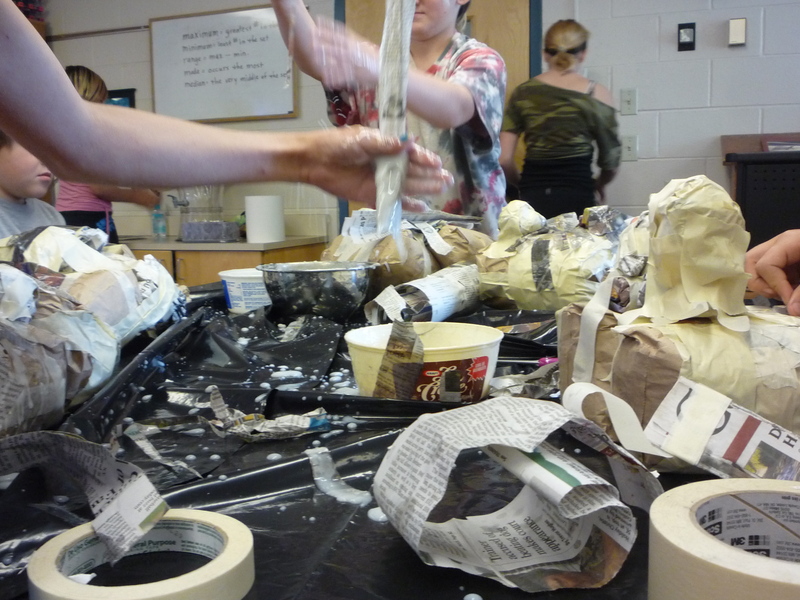 Papier-mache is a messy but interactive process. Last week’s paper bag and newspaper piece was used to create the armature. 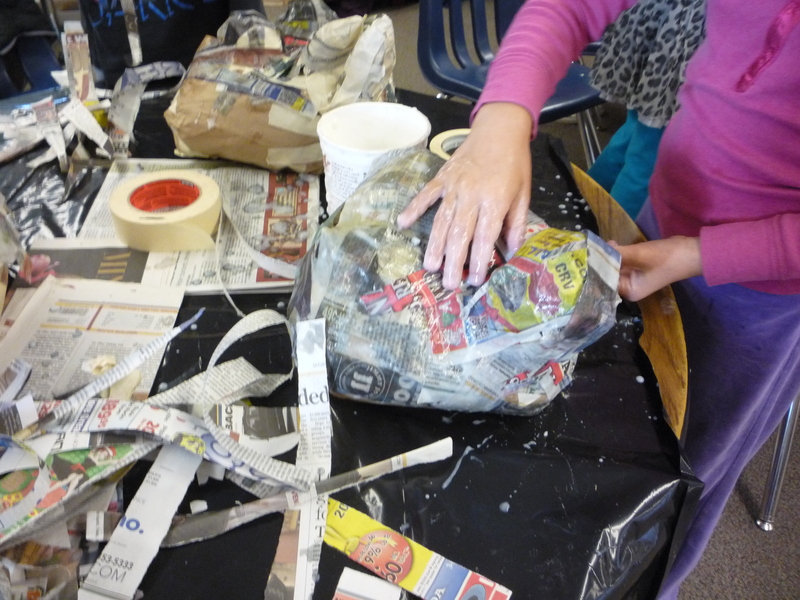 Using newspaper dipped in a wheat-paste mixture, students worked to cover the whole front side of their piece in papier-mâché. When it dries, the papier-mâché will harden and create a stiff surface to be painted on. At the beginning of the class, some students were still working on creating their armatures. Student 1, who had created very long and exaggerated ears from newspaper for her alter ego the week before decided that the ears would be more effective if they were made out of another material instead of papier-mâché. She decided to take the ears off for now and worked on building up the forms on the face. Student 1 and the other two students at her table are working on creating masks that show the animal-qualities of their alter ego. Student 1 and her table mates building armatures. 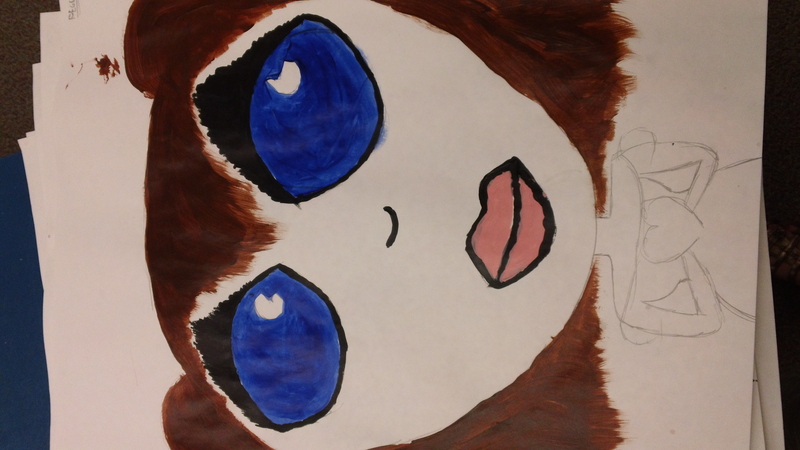 Student 2 recalled the way her painted caricature had exaggerated eyes to show that she like to look and observe things. As she built up her armature, she made the eyes bulging from the head for the same reason. 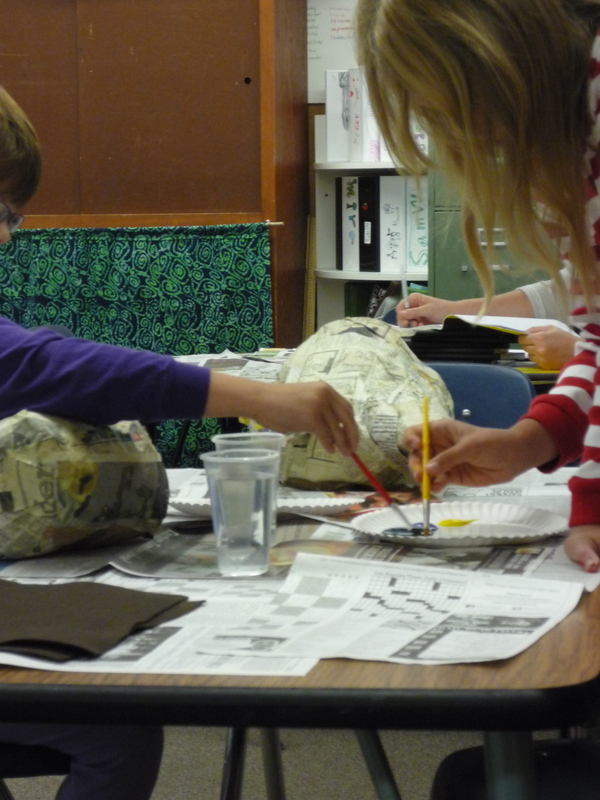 As they worked, students discovered different methods that worked best for their own style. While most dipped the newspaper strips into the bucket of wheat-paste, Student 3 found it helpful to add more wheat paste to the surface of the mask between layers so he could more easily move the strips around. Student 1 discovered that smaller pieces of paper helped to cover certain areas better than larger pieces of paper. She considered this when covering the muzzle-like nose of her mask. Student 4, however, found that it was easier to shape the paper around the features, then covered the paper in wheat paste. Each child practiced the method that worked best for their own style. 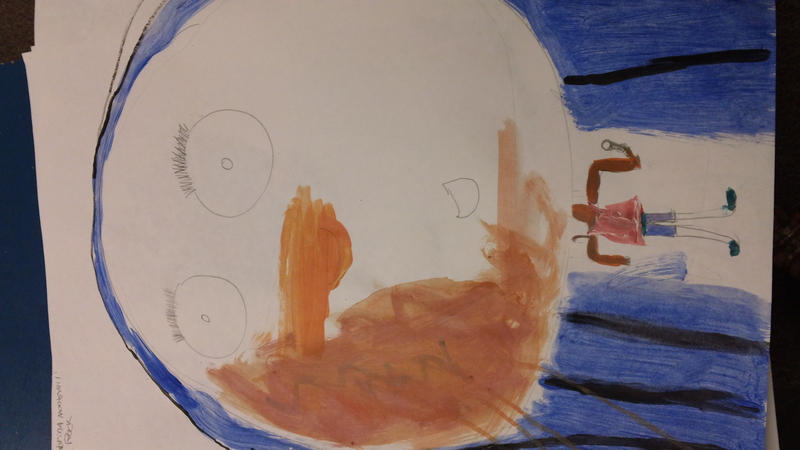 Student 5 was disappointed when the large eyes she created the week before had begun to sink into the head. In order to continue to keep the eyes large and bulging, she layered on crumpled-up, wheat paste soaked newspaper, then adhered them down over the eyes with paper strips. The work was messy, but the results were clean! The process allowed students to work with a material they do not often have the chance to use, and helped to show ways they can build volume and form. On the fifth day of class, we put away our paintbrushes and began working on a new lesson. 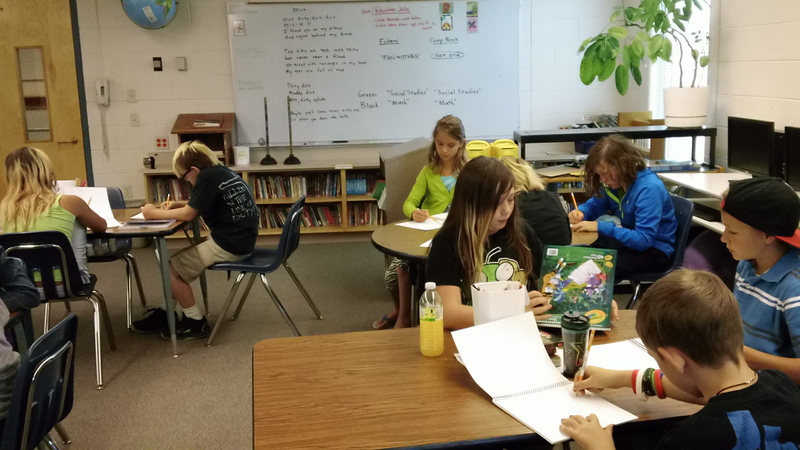 Still focusing on our alter egos, and looking at ways to exaggerate features and form, the class began a quest to transform their two-dimensional caricatures into a three-dimensional mask. Rather than painting their alter egos on the flat, the students will now be able to see how the form can be built up and exist in a spatial world. Students learned about armature, the skeletal structure of a sculpture. 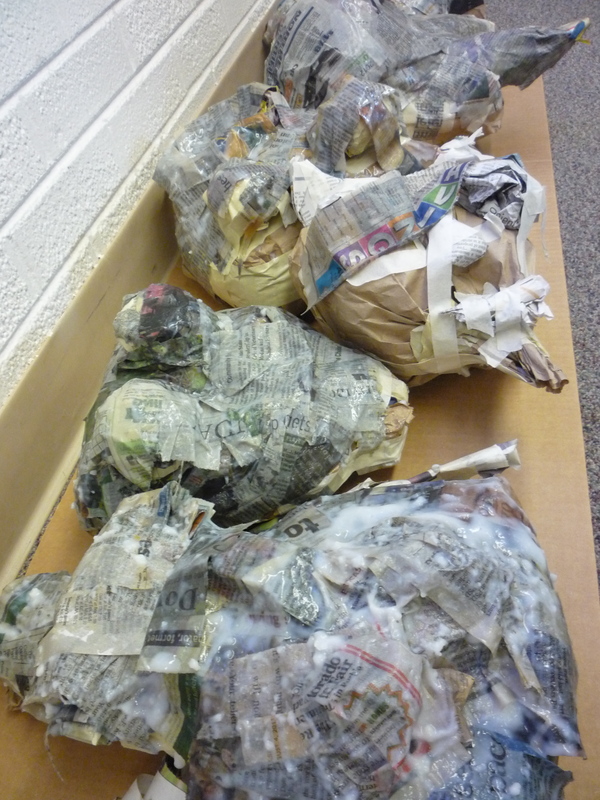 For this project, students created their armature using brown paper bags and newspaper. We began by discussing ways in which forms could be exaggerated into 3D, and students took turns trying out different forms. How could we exaggerate the nose? 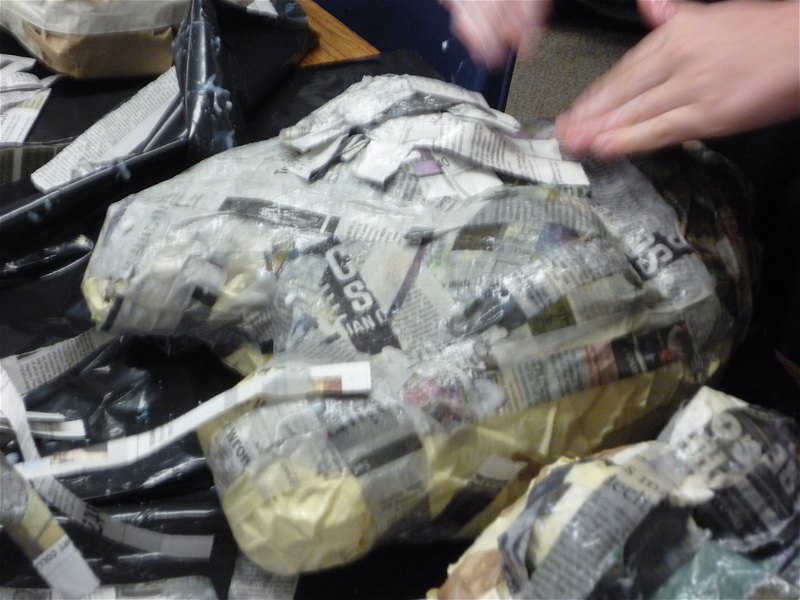 One student suggested using lots of crumpled newspaper to make it stick far off the face. Another suggested using only a small amount of newspaper rolled into a ball, to make the nose feel exaggeratingly small. 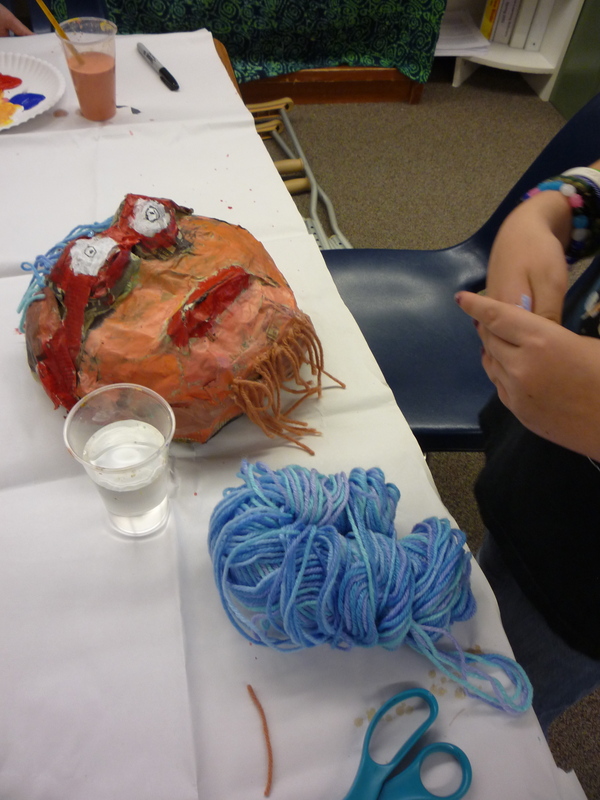 The students took turns creating examples of 3D facial features during Hilary’s armature demo. One student asked how the whole head could be exaggerated, since using paper bags already made it very big. 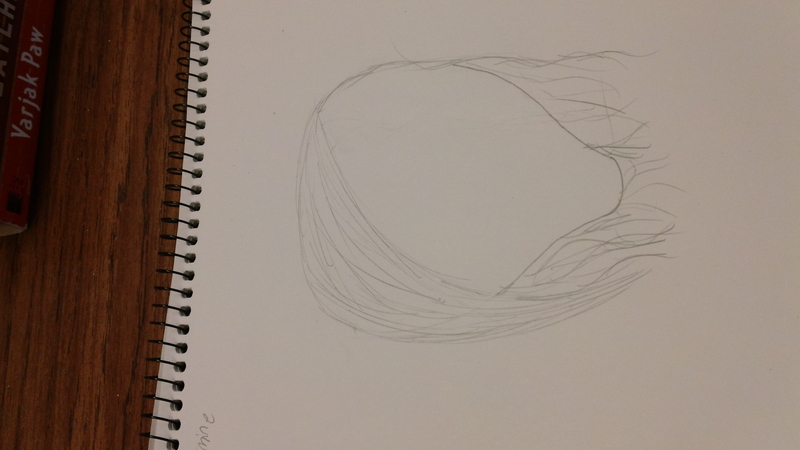 A second student suggested that the head could look bigger by making all the facial features very small. 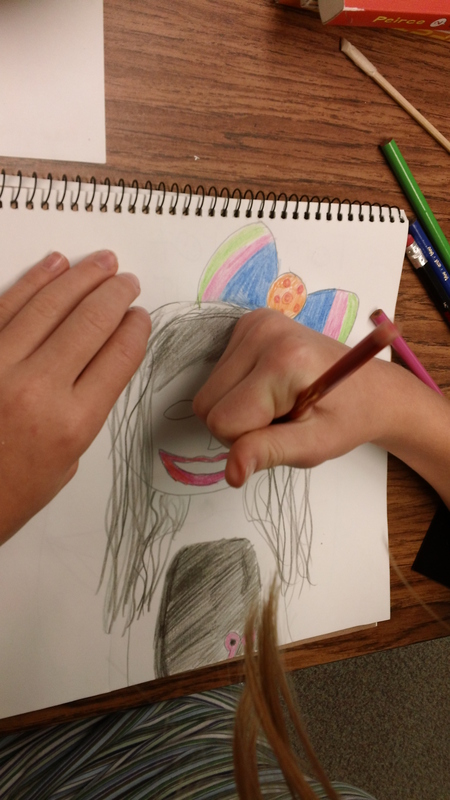 Before beginning their own armatures, the students created sketches to designate which facial features they wanted to exaggerate on their sculpture. By now they were able to quickly make these decisions, which shows they are much more confident with this concept than the first time they drew alter ego sketches. As the class began their armatures, they continued to make discoveries in ways to build up form and convey exaggeration. 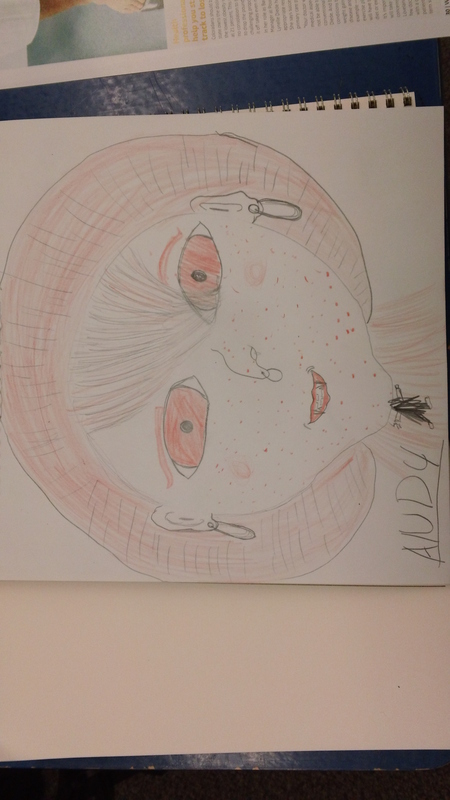 Student 1 wanted her alter ego to have animal-like qualities. She explained that in real life, she loves to talk, so her alter ego would be quiet and shy like a rabbit. 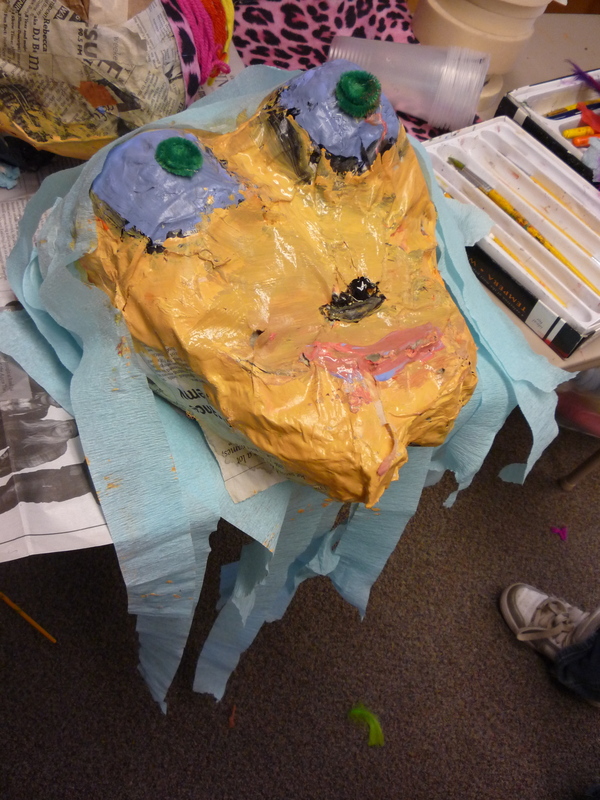 This student built up the newspaper high off the surface, covering most of the face to create a muzzle-like nose. Student 2 wanted to make a distinct face shape on his mask. This shape, which he included on his painting as well, is used to exaggerate the mouth into a long shape. While most students were using two stuffed paper bags, he decided to use a third just for the long jaw. In addition, he wrapped it with lots of tape to keep the shape thin. 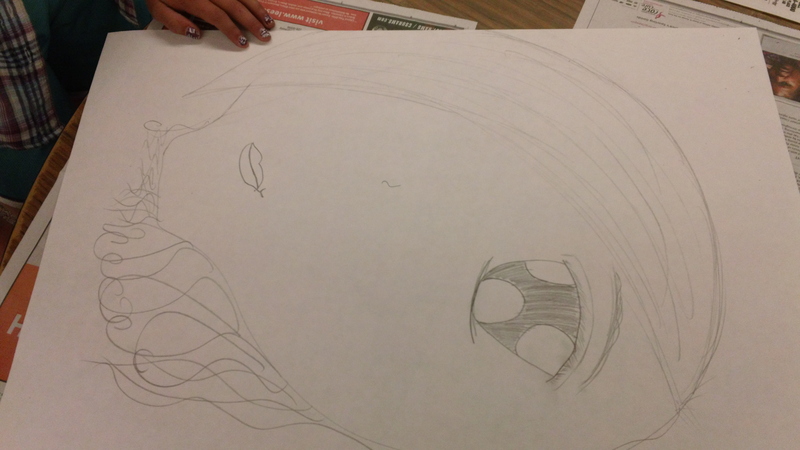 Student 3 wanted to exaggerate the eyes the most, because her alter ego “can see everything.” She decided to make the eyes the largest, and emphasize this more by making other features even smaller. Something else that students practiced during this class was collaboration. 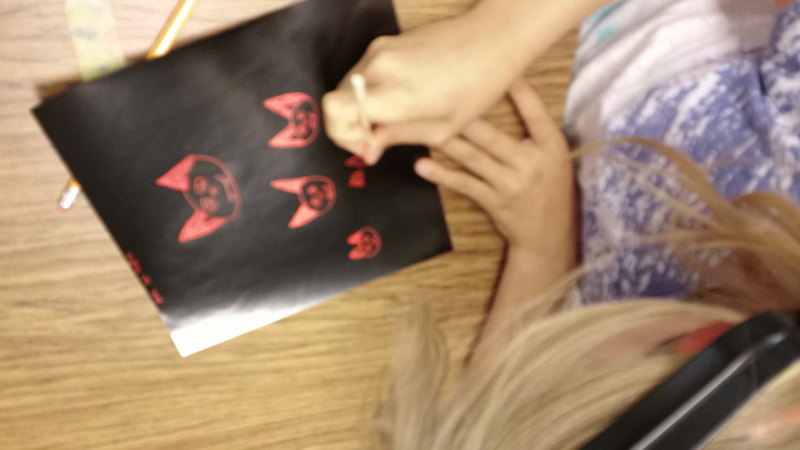 Many students worked in groups to tape the pieces of their masks together. They found that if they worked together, it was easier to hold pieces in the right places and build up forms. This is good practice for our final lesson, in which students will be working in groups to create their piece. Today class finished up painting their alter-egos. They got to work quickly and were very engaged the whole class, one of the studio habits of art. As I went around, I decided to focus on four students this time so I could capture their learning better and really get in-depth observations of how they went from process to process. I am going to start with one of the students that isn’t too fond of art and who has a little attention span. He likes to wander around the room and trying to get conversations about his work is a little difficult because he doesn’t like to talk about his work or his processes but is evident that his work is very creative! When I caught up with him this time, He had the same employer idea but this time he said that “superman was in a cave.” When I tried to ask why he made another artistic choice of putting his employer in the corner of the page, he became defensive almost like I had cornered him by asking him questions about his artwork and abruptly said “I don’t know and walked off.” I realize that this was the extent to which a child can be pushed. We have learned that as art-educators there is a line between pushing and letting them be comfortable in their process. I realize that this student is a little harder to talk to but that the evidence of his creative thoughts definitely come out in his artwork. The next student is one of the most diligent students in the class. She gets concepts and is very bright, but extremely shy. She clearly understood the concept of caricature because in the first weeks observing, she was one of the first to sketch a big head. Catching up with her this week, i saw that she understood how to exaggerate to emphasize features and that she took the assignment in a little bit of a different way. When I talked with her she said she exaggerated the eyes not because it was going to be a trait of her alter-ego but because she herself had big eyes. This is where the idea of fluency comes in. We have learned that if we can tell as teachers that they understand the assignment but want to manipulate it a little differently that’s perfectly okay because behind that choice was still high creativity. The artistic choices she made had to do with reflection and re-intention, two processes in the creative method. She reflected on how her face didn’t match her body from last week’s portrayal, and said, “I think I might re-do the body to match the face.” She changed the color to match her intent. In the beginning Eileen and I had wondered whether she did this on purpose to incorporate her skin tone with her peer’s opposite skin tone to portray the inclusion she feels or whether this was an accident. She said she would repaint the body to match the face which was a mixture of the two. Instead of having a clear mark of black and white skin tones, she created this hybrid red color for her alter-ego’s skin tone which show the inclusion or mix of the two in a new way. 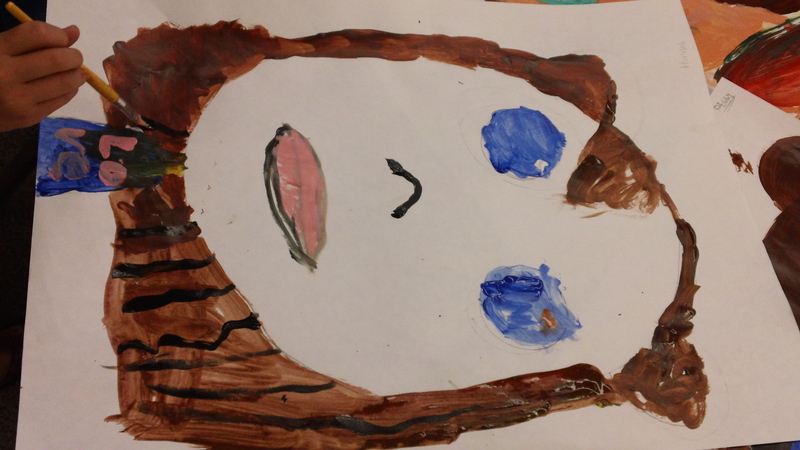 Although she didn’t verbalize it, it was evident that she was adding black lines to create texture for the hair. Eileen had gone over how to paint different lines to create different texture. I think this sunk in and created a non-verbal artistic choice. Even though, I couldn’t get answers on why she made the choices to purposefully reflect traits of her alter-ego, this was the first time I was able to talk to her about why she had made something. It was very rewarding to finally reach this student and get a little information out of her. She seemed to like creating which is the bottom line most important thing! This week she moved on to the face and the background. Today the class begins painting their alter-egos! The class is super excited to dive into working with paint! Eileen first starts the class with color mixing theory. 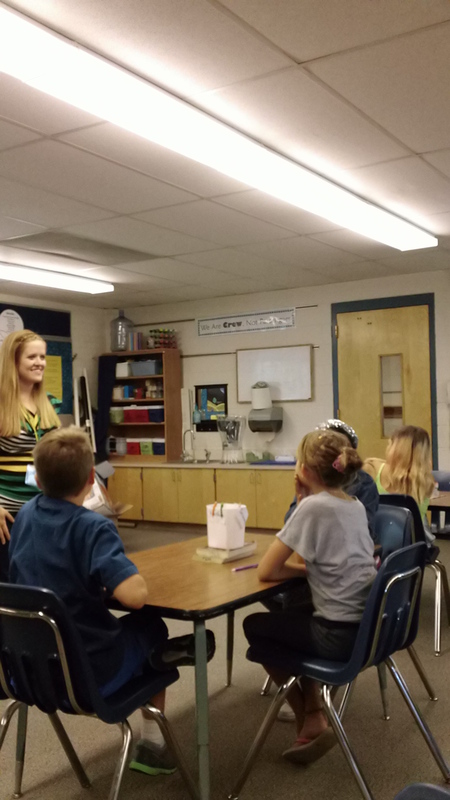 She tests the students’ knowledge to see what they know about color. 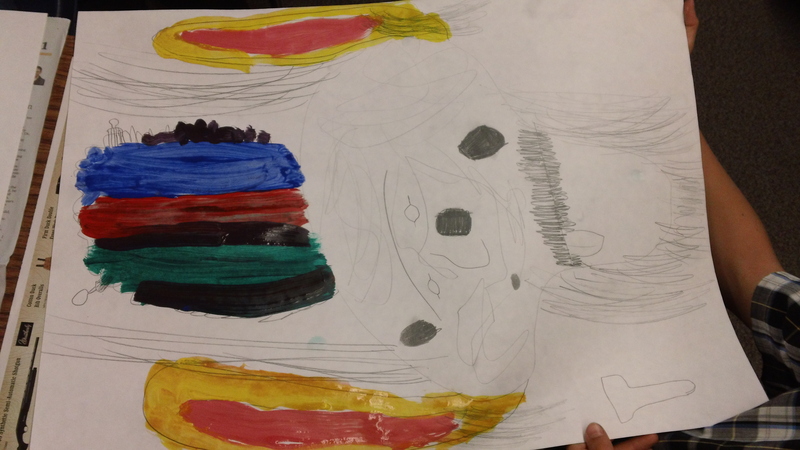 One of the students shows advanced knowledge about color theory stating the primary colors and that black and white are considered shades. She also demonstrates knowledge of texture by saying that if the brush is pushed down on its head and twisted, a grassy texture will appear. Another student also demonstrates texture knowledge by saying that many lines next to each other can represent the texture of hair. Another student demonstrates knowledge on how to use the brushes. She states, “tiny brushes are for detail and big brushes are to cover.” Overall, I am very impressed at how much the students know about brush technique, color theory, and texture which are all objectives of our lesson. As this student was talking to me, she described how her caricature developed. 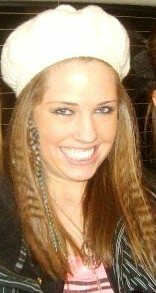 She said that she didn’t know how to make curly hair so she just made crimped hair. This relates to our discussions on how kids will make something they know, or something they’re confident in making until they feel that inner satisfaction at mastery to push themselves to experiment more. She also told me how the hair of her alter-ego changed colors because she couldn’t get the same original color when she tried to mix color. She observed how the color changed from maroon to darker purple and reflected to realize that she liked this. She re-intended and said she wanted the darker purple to now fade back into the original color. She exemplified key components of how art making works; intending-observing- reflecting-re-intending. It was cool to see what we have learned about the art-making process in action with our students! 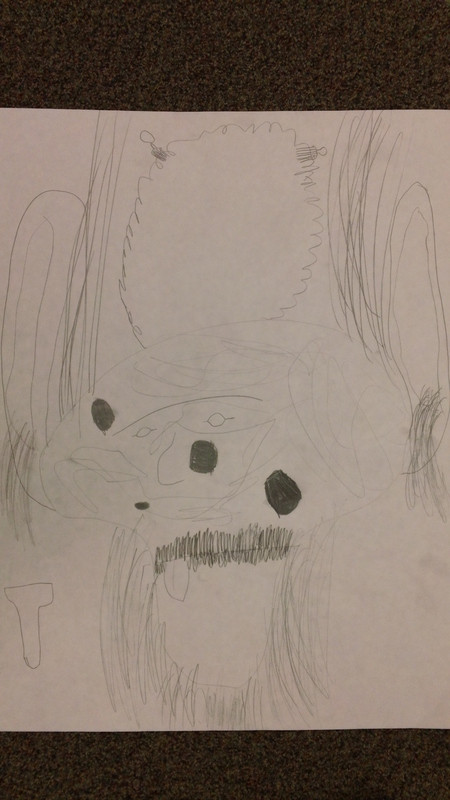 The next student shows his understanding of the alter-ego through caricature very well. He makes sketches and has a permanent idea for his caricature throughout the classes. The way he explains what his caricature is and why the features are enhanced, reveal that he has a firm grasp on making an alter-ego through caricature. He states that his is a French man with ‘bo-zo’ eyes. Both of these things are opposite of what he is. He is an American and very bright which is how his caricature is completely opposite. He exhibits full understanding. His caricature is fun and goofy! The last student, has loved creating. He also has taken a pretty concrete idea and stuck with it throughout the last three weeks. His caricature couldn’t be further from his ‘real-self’ as it illustrates a hobo with an afro. He went to town more with making something as wild as his imagination could take him rather than really thinking about what he would want to be in another life. His idea however, is still as ingenuitive and creative, if not more, as other caricatures representing the ‘true’ assignment. He asked me how to make skin color. Reflecting back on this I realize how this moment was another example of art-teaching we have learned. We have learned that art-teaching is a mixture of showing/demonstrating and pushing the student to experiment and discover for themselves. I realized that what I did by making the skin color for him was probably okay because it was base knowledge that I think was important for him to know. I pushed him and asked him what would happen if the skin color was too orange or too yellow, and he was able to answer this now with understanding. The class will spend one more day painting their caricatures and making them come to life! Today, the class is excited and eager to continue working on their sketches. Eileen goes over what they learned last week asking the students what alter-ego and caricature are. She starts the lesson with a fun activity on the smart-board enabling the students to compose different caricatures. They love taking turns and coming up to change or add different features. One of the students shares that even if a feature is normal size, if the other features are made smaller like the face outline, it will make the original feature seem bigger and more exaggerated. This is wonderful insight and shows that she understands how to make features exaggerated to portray different things. After Eileen recaps last week she tells the class that they will experiment with scratch art and continue making sketches for their caricatures. They are excited to see that underneath the black is a bright color. Each student begins scratching color and ideas. 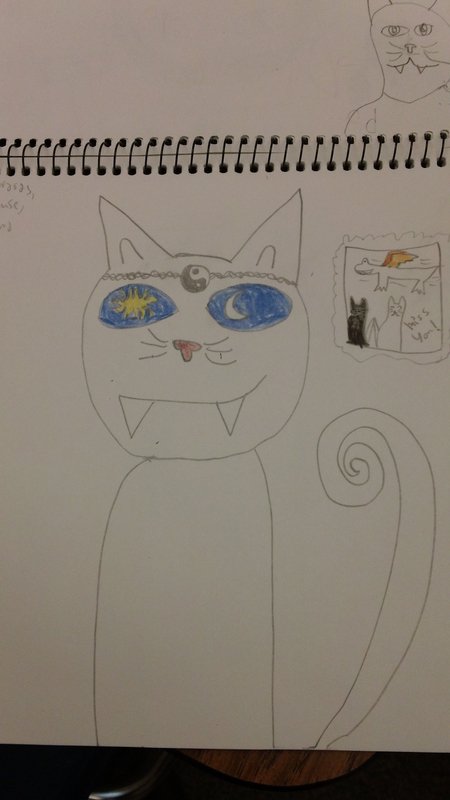 This student does many sketches for her alter-ego which is in the form of a cat. Instead of doing an alter-“personality” her idea is herself in another or “alter-form,” an egyptian cat. We have learned this year the importance of fluency when teaching art. This refers to the many different forms artwork may have in regards to an assignment. We have learned that this differentiation should be accepted and supported because every student thinks a different way. It is also the differences in interpretation that make art so interesting to look at! She then moves on to her sketchbook to finalize her idea. She chooses one to draw in detail. Every feature symbolizes a personality trait of the student. Her final sketch reveals advanced thinking. 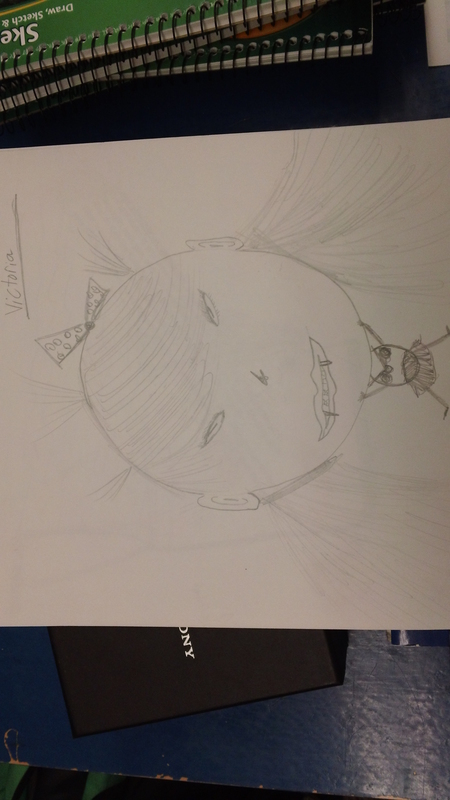 Another student exhibits two completely different ideas for her caricature. 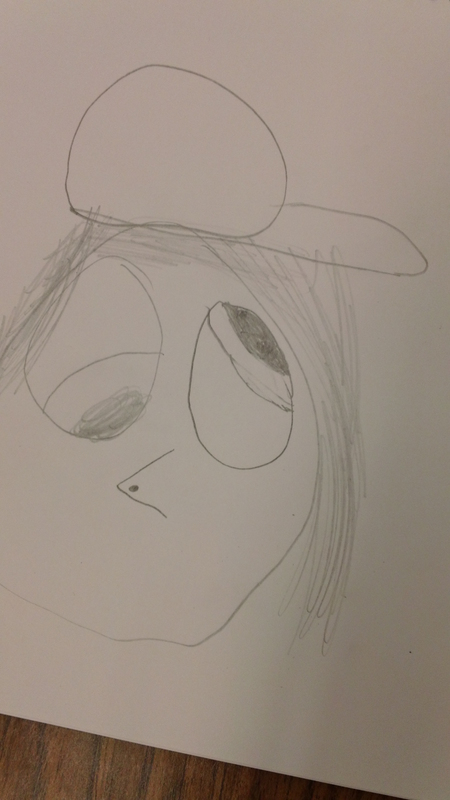 She first draws a caricature with red eyes and a ‘beanie,’ then a completely different one she calls ‘victoria.’ Both sketches represent her caricature being mean. She accomplishes this by experimenting different ways to do this. 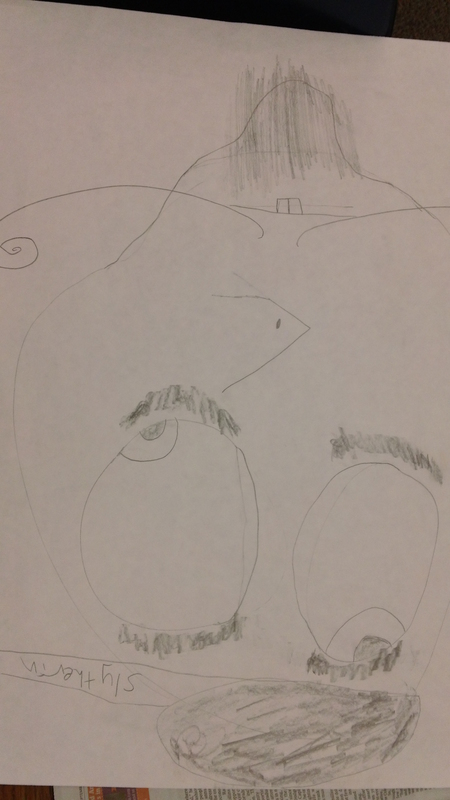 This student’s sketch is not a typical caricature with the large head and little body, however after we talked to her, it was evident that she was exaggerating the mouth to signify that her alter-ego talked a lot. She demonstrated that she fully understood the assignment because as a shy student, she depicted that ‘alter-ego’ liked to talk a lot, the opposite of her real self. She conveyed this by drawing a big mouth. The bow seems to be added purely for expressive quality, for her like of colors. She also depicted her alter-ego in black because in real life she hates black. Although her sketch is not like the caricatures we showed to introduce the concept, it is evident that she understands the assignment. The last student only gets to spend ten to twenty minutes in the class, so we try to find accommodations that allows him to have extreme flexibility with the assignment. I tried to briefly tell him that the rest of the class was doing a caricature on their alter-ego which is the ‘self’ they would be in their other life. I thought it’d be more worthwhile for him to create than to listen to me talk. With a realization that it was okay to let him just ‘play’ I left a little disappointed that he couldn’t get the same instruction of the rest of the kids because he was very bright. 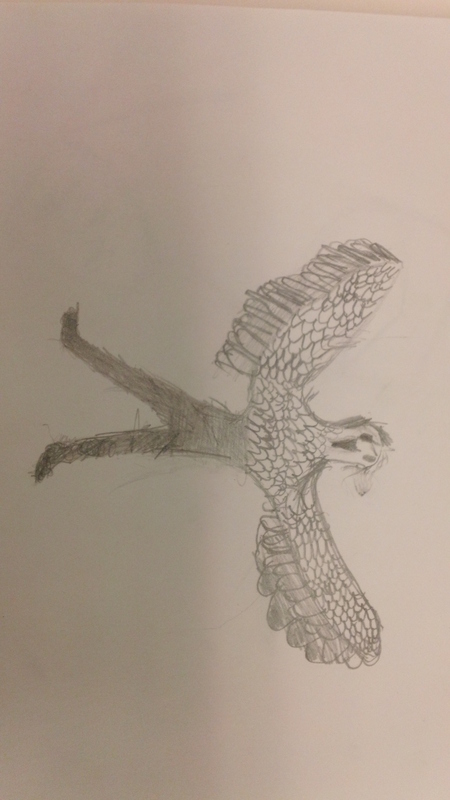 However, as I heard another student say “Wow Rune, that bird creature is perfect for your alter-ego,” I quickly realized that he understood the concept the whole time. He created a hawk bird that instead of different personality traits, represented his other self as a different form like Mira’s egyptian cat. He said that he “likes to fight like honorable knights that fight with swords and things” which is why he didn’t depict a hummingbird. He’s also always wanted to fly which is why he thought the bird-creature would be another good ‘animal-self.’ I realized once again that fluency is important to keep in mind. His hawk was a different manifestation of the assignment and it would have been foolish to stump this creativity for the purpose of our own criteria. This is an extremely important lesson to keep in mind with elementary art students. 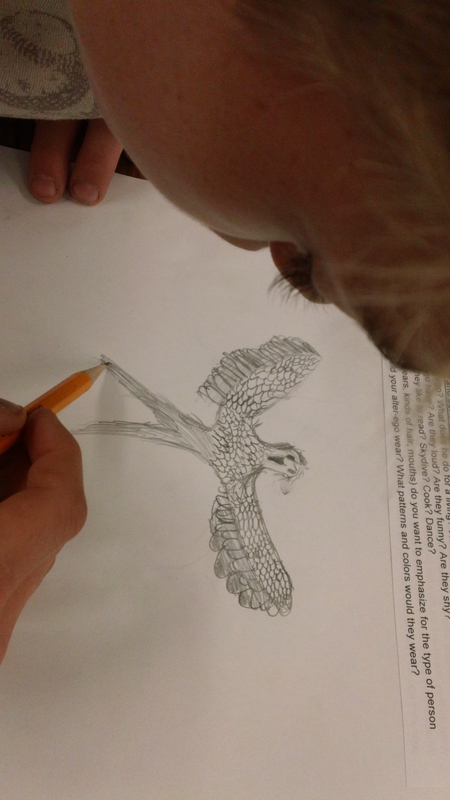 The students made a lot of progress finalizing their sketches for their paintings they will begin next week! Today FourFiveArtAlive took hold with Tom’s Fourth and Fifth Grade class exploring the alter-ego.The lesson includes formulating ideas through their sketchbooks; painting a caricature portrait; painting the caricature; then later making a digital story of their alter-egos actions through claymation. We started the lesson with the action-to-motivate which is a way to spark curiosity and get the students excited about the lesson. I came in as Eileen’s alter-ego, a ‘pop star,’ dressed in feaux-fur, purple cowboy boots, sparkle gown and headband. This was done to show an example of a complex concept. Eileen continued by showing an example from Mrs. Doubtfire, a movie to show another example of an alter-ego. This really grabbed their attention and sparked their interest in the lesson. The students were very attentive and excited to see what was in store for their eleven week journey creating art! Eileen introducing the concept of the alter ego. After introducing examples of what an alter-ego is, Eileen moved on to introducing caricatures. She began showing examples of famous caricatures such as Obama; Justin Bieber, Miley Cyrus and Michael Phelps. Eileen asked the students what features were enhanced, starting with Obama. A lot of the students said that his mouth was exaggerated. One student responded that it could be because he talked a lot and another said it could be because he always smiles, two great responses of why his mouth was exaggerated! Eileen then asked why Michael Phelps might be depicted as a merman in his caricature. A student responded that it’s because he likes to swim and is very strong.” Another said, “to make him look like an Olympic swimmer, they made him look animal-like because some animals are very good at swimming.” Both students had very good insight into why the features were enhanced in these celebrity depictions of caricatures! After they seemed to grasp what caricatures were, a big sketch pad was set in front of the class. In a joint effort, the class began to make a caricature of their teacher Tom’s ‘alter-ego.’ They decided he would be called “Tom-Mot” since mot is the opposite of Tom’s real name and thus made sense for the name of his ‘other self.’ Although they came up with personality traits that were similar to Tom’s like being bold, extroverted, and outgoing, it was obvious they understood how to portray these traits in his caricature. “Give Tom-Mot small ears because if he likes to talk, he doesn’t like to listen”…and “Give him big eyes so he can look around the room and see who’s not paying attention,” said another. 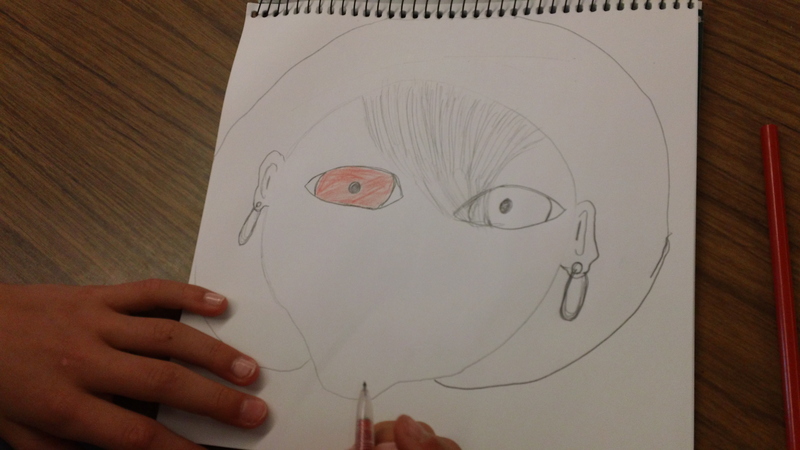 Both students showed that they knew how to depict facial features to convey personality traits. As the students each took turns in adding on a feature to Tom’s Alter-ego, they engaged in the process of teaching known as Ideation/Inquiry. Making an example of what they would be asked to do first as a group project was a tool to create ideas. The sharing of these ideas in front of the class was meant to spark their own for their own projects. After the students seemed to have a firm grip on what an alter-ego and caricature is, Eileen gave the students their own sketchbooks. She explained that the project will be centered around creating a caricature of the student’s alter-ego. As they began making sketches the Ideation/Inquiry process continued to take place. They were asking themselves questions like what traits did they want their alter-ego to have? Were they shy, funny? loud? and what sorts of features do they want to enhance (eyes, nose, mouth, ears, kinds of hair) to emphasize the type of person they wanted their alter-ego to be. The students all seemed really engaged and excited to be doing art! They liked the idea of having their own sketchbook. As art educators we have learned that keeping a sketchbook is essential for recording ideas and planning. One of the essential steps in the art making process is planning out ideas and thinking aloud on paper. This fosters a way to envision ideas for projects as well as a good way to reflect on how their end artwork is similar or different to their initial sketches. is also a good template to talk about why their work changed along the way. The students will continue on these sketches next week to finalize their caricature for their painting. Hi, my name is Eileen. I am majoring in Art Education at Colorado State University with an emphasis in painting and a minor in Spanish language. 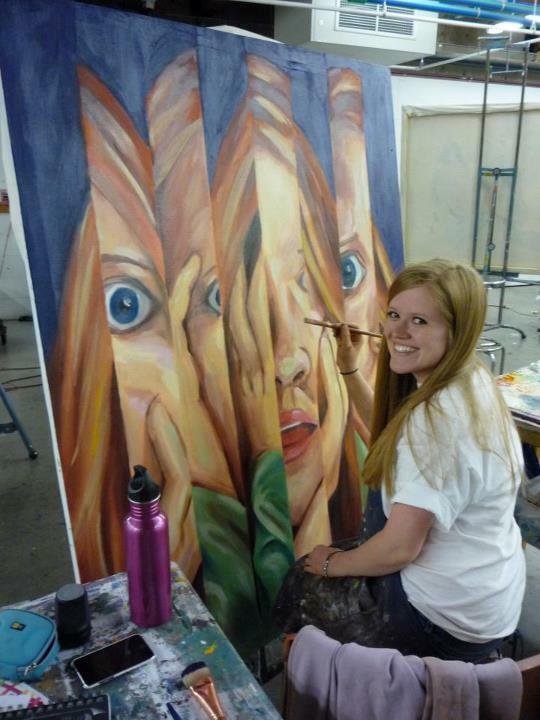 With a tremendous passion for art, and a love for teaching, I discovered art education is the path for me to take. As an art educator, I hope to guide students on a path of art and learning. It is my role as an educator to prepare students, and I believe the best way to do this is through an understanding of creative thinking. I am very excited to work with the students in Tom’s class this semester, and I can’t wait to see the art they will create! My name is Hilary. I am also an Art Education Major at CSU with an emphasis in painting. Art has been my passion since Kindergarten. It wasn’t until a service learning project through my high school teaching piano to a wide range of students that I realized teaching is what i want to do. I believe above anything teacher’s should have a relationship with their students that fosters trust, accountability, and care. As a teacher I aim to push my students to be the best they can be, and to create well-rounded individuals in all aspects of their life. I am excited to be in an expeditionary learning environment because I believe creativity is the key to any path of learning!